So after all the " Oneplus Cardboard " deal which was much exaggerated for the official release of Oneplus 2, many were lucky enough to snag one online & Yeah i got one too via Amazon. 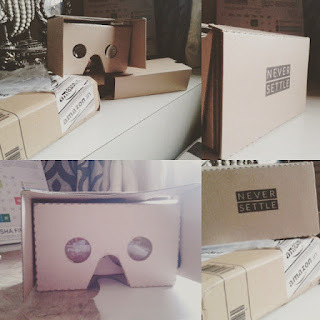 Couple of weeks ago, I saw that Oneplus 2 will be launched through VR based keynote. I guess this was mainly the reason why people bought it. But it seems like there's not even a single post yet, that let's you set the Oneplus Cardboard viewer properly and I'm speaking about the software part. I called their Customer Care just to know the set-up process & the answer that I got was, " Sorry Sir we don't know anything about it, kindly go in our forums ", I mean wow ! Now i know why people say that their customer care services are pathetic. Oneplus if you reading this, kindly put some Geeks there who atleast know something of what they're talking about ! So I came to know that you need a Cardboard app ( Android, iPhone) for it to set up. So i downloaded it, but then I came to know that you need a QR code that lines up perfectly the width, height & length from the lenses to your smartphone. Just so you know the default Cardboard App in-built has Google Cardboard's default setting, So no matter what you try, you're going to mess things up. Then i came across a link on Reddit, which claims to be for Oneplus Cardboard, that didn't worked out for me either(QR code), though there was a link beneath that redirected me to a page by Google & that's how i got my Oneplus Cardboard all settled up. So let's find out how to set-your Cardboard. Head over to Google Cardboard Generator & then check out whether your phone sits in proper requirements necessary for the set-up. Click on Skip, then you need to fill in proper things. 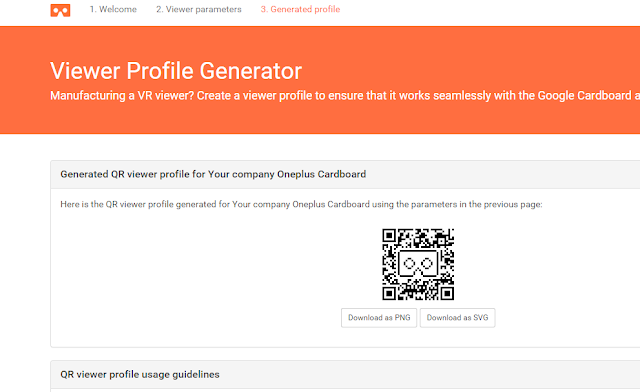 Put or leave the Company Name( As we simply need to configure our VR headset). If you've Physical hardware navigation buttons go for : Indirect touch. Quicknote : I've a spice dream uno(Android One) 218 ppi & 4.5 inch screen, following are my reading & your readings might be different. This is basically the distance between your Cardboard's lens & your Smartphone. Distance between those two lenses(center axis part). Then select Screen vertical alignment, mostly it's bottom. Leave the Distortion coefficients part & Simply click on Generate Profile. You'll be landing onto a page with a QR code, Simply fire up the Cardboard app on your device & select Cardboard demos & then click on the settings icon that shows up right in the middle of those 2 partitions, then click setup & scan the QR code from your browser. That's it, this might sound a tedious process though it isn't, I've just elongated everything for you viewers to understand it in a proper perspective. So after scanning the code, you can enjoy all the things that were distorted in the Cardboard App before. Spoiler : A Pocket friendly price tag sounds crazy isn't it ? But the trade off isn't worth it. Why to go by this process Oneplus ? You guys could've simply made an App. One thing is sure though, you'll have a headache after 15mins of its usage, not sure how people will watch that launch event for an hour or so(that goes for every Cardboard out there), but hey that's fun! After setting it up I've been playing with it all day long.